Planning consent has been confirmed for the development of a former disused RAF airfield in Oxfordshire. Hayfield will be injecting a new lease of life into the disused airfield near the village of Stanton Harcourt in Oxfordshire, creating a landmark development of one-, two-, three-, four- & five-bedroom new and restored homes. To retain its historic significance, Hayfield will be bringing some of the remaining buildings into the modern day, with careful refurbishment. Other historic structures will be brought back to life and used as informal recreation features, with informative boards explaining their heritage. A pattern of walking routes will weave its way through Hayfield Green and along the airfield’s former taxiway so that residents, locals and visitors alike can partake on a historical journey of the site’s story. A new community hub will also be provided within the refurbished former Guard Room. 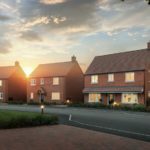 A range of house types will be on offer at Hayfield Green, from two-bedroom bungalows to five-bedroom detached family homes, each with spacious gardens and private parking. With planning permission confirmed, Hayfield is aiming towards an off-plan launch in April 2019, with a show home opening in the summer.